Do you have a tired, dated home in need of a facelift? Your answer: exterior paint! Probably the most economically friendly way to drastically improve the look of your home. And not to mention, protect its surfaces. 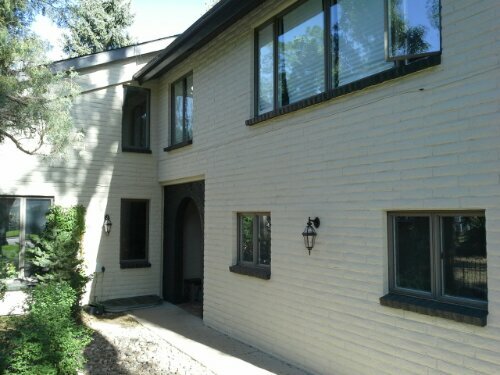 Above, is a recent exterior paint we completed. The previous paint was a pinkish-beige that was leftover from the 80’s. In conjunction with the size of this home (its large! ), the curb-appeal was rather… scary. With some research and consideration of customer preferences we settled upon a color palette. Bringing in some neutral, timeless colors and keeping with minimal accents, we were able to create what appears to be a new home! Well, not new, but up-to-date, contemporary and full of style. The black trim, soffits and accent areas provide a good amount of contrast and ‘weight’ to balance out the massive walls. The different textures (brick, stucco) are kept together by one color and separated only by texture, sticking with a minimal yet sophisticated look. The change was much-needed and looks beautiful! Call us today to schedule an estimate for your exterior home paint!